I often have a hard time explaining to friends and family what exactly INTViewer does. The moment I use the word “seismic,” the listener’s mind automatically shifts to the topics of seismic activity and earthquakes, and I need to explain oil & gas exploration technologies before I even get to the software. By then, I have lost my audience. Today, I’ll try a different technique: I’ll describe the capabilities of INTViewer that actually cater to earthquake mapping. 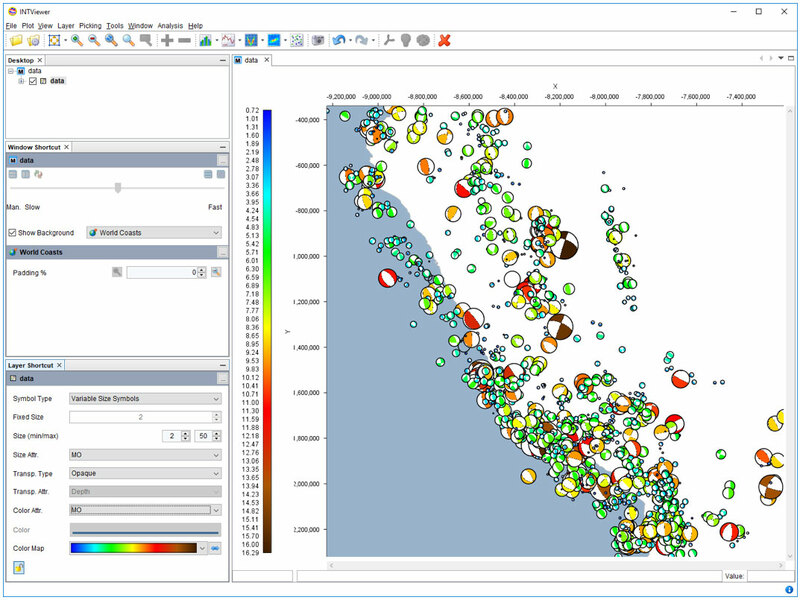 I will show how you can use the built-in capabilities of INTViewer to map recent earthquake activities. To prepare for this blog article, I needed data. The United States Geological Survey (USGS) provides recent earthquake data on their website. The color of each dot identifies the magnitude of each recorded event. I choose Bing Maps to show these events in context, requiring the installation of the free RemoteMap plugin. There are a few websites proposing similar visualizations, but INTViewer can go further than these websites. For this example, I went to another data source, the International Seismological Centre (ISC) in the UK. 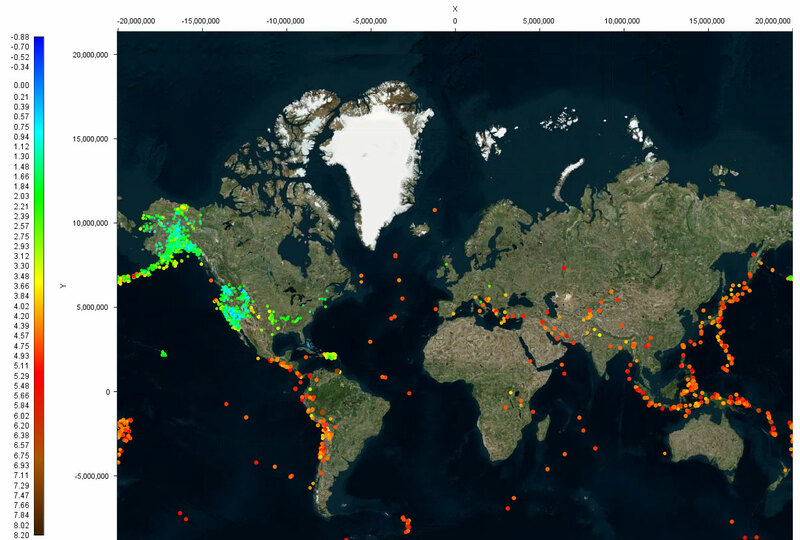 This association compiles records of the earth seismicity, and provides a convenient way to search those records. I decided to map earthquakes in Peru (longitudes from -83° to -65°, latitudes from -3° to -20°), starting from the 1970s to today. 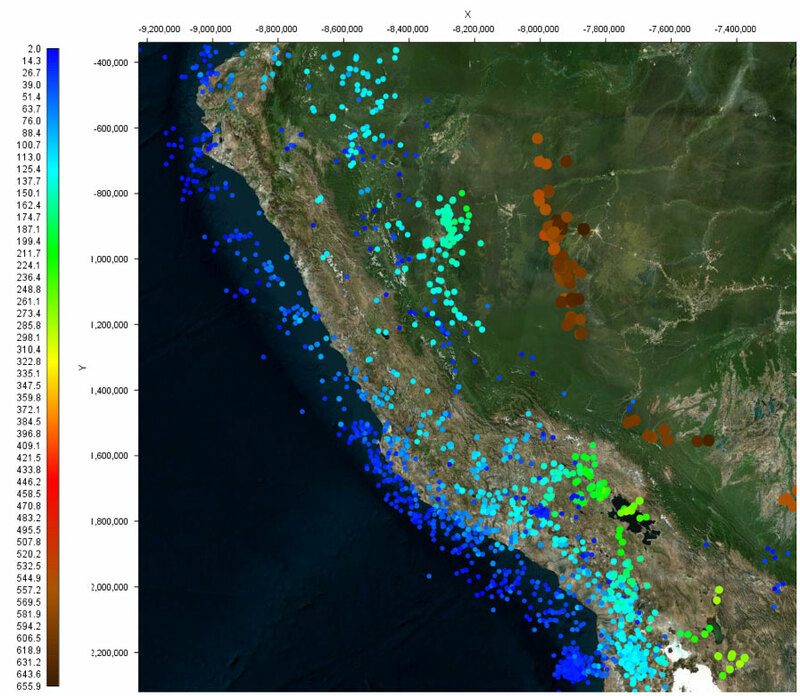 In the visualization below, the color and size of each dot identifies the depth of each recorded event. Visualizing nature’s earthquakes is, of course, not a typical use of INTViewer, since most will use it as part of their seismic exploration QA workflow using data from manmade seismic events, but it is an interesting way to demonstrate how it works.